In the late 1880’s the parish considered building a larger church further east on James Street, but this proved to be a contentious issue. On January 4, 1890 a fire broke out at a picture framing factory that abutted the churches northeast corner. Due to the flammable nature of the factories contents the blaze spread quickly and a rear wall of the factory collapsed onto St. James Church, causing extensive damage. Debate ensued within the congregation on whether to move or rebuild the old church. Rebuilding was eventually favored. However, subsequent events forced the issue in the opposite direction. On March 14, 1891 five major fires broke out in Syracuse within a twenty-four hour period. The largest began in the Hogan Block of the corner of East Washington and Warren Streets and laid waste to two city blocks. One of the other firs began at St. James Church, when embers from a heating stove set a carpet on fire. By the time the fireman arrived “the interior of the church was a blazing furnace” in the words of the fire chief. 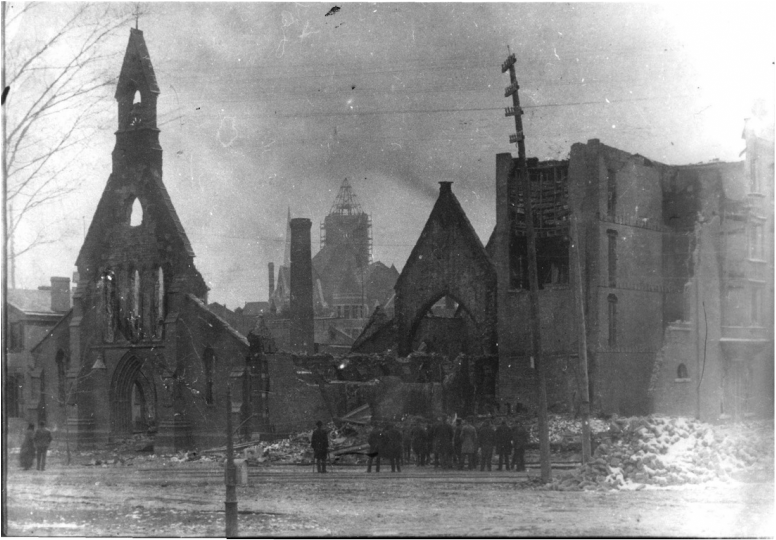 Within ten minutes the church was reduced to ruins and the fire had spread to the adjacent McLennan Flats.